I know that it is a New Year and there are lots of resolutions floating around and most of them are involving a diet of some sort. 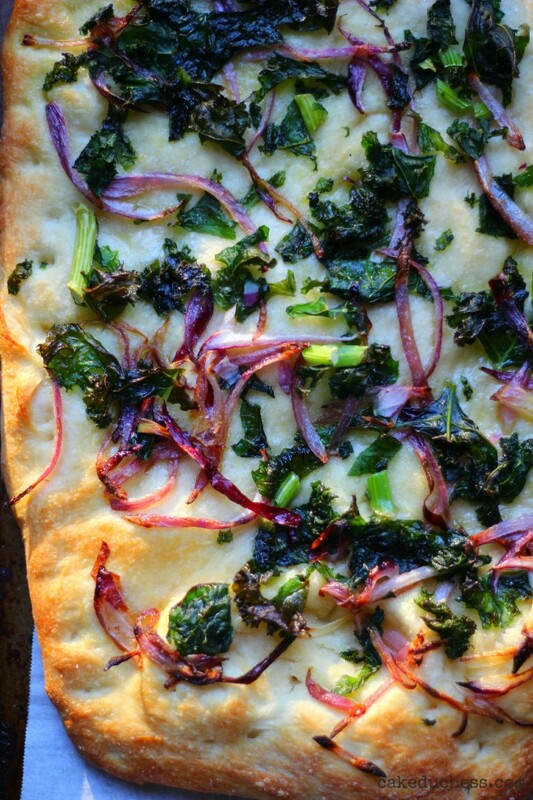 Could a Kale and Red Onion Pizza fit into your new diet? Possibly! This pizza is vegan, vegetarian and I can even say it involves some whole-wheat flour! Phew! Does that make you happier than a chocolate cake in the month of January? I know, I should be posting clear broth recipes. I will get to that another time! In the meantime, you must try this simple pizza! When I say simple, I mean simple for the fact that the topping is very minimal. There is just the greenest of kale. The sweetness from the red onion. No cheese. Yes, I said, no cheese! You don’t miss the cheese. You don’t believe me? Ask my kids! Yes, they are the true taste-testers for any recipe. They devoured their slices. 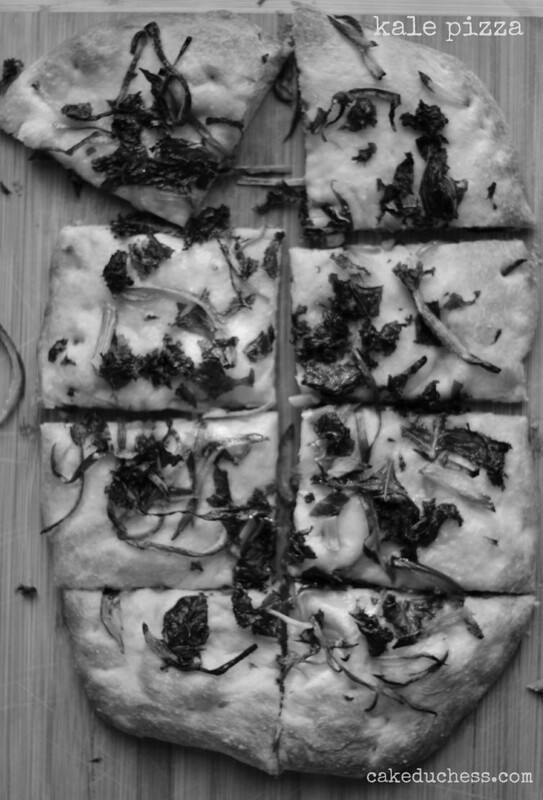 Kids eating pizza with kale? You bet! And I was told, “Mommy, this is the best pizza ever!” Ok, I know my kids have different taste buds than the most typical American kids. I mean, my mother-in-law sends care packages with olives from Calabria and my son rushes to rip open the box and start eating. He loves spicy food. He even eats anchovies. But again, not the typical kid. SO back to this pizza. This is something you may find me making at the Cake Duchess HQ on a lazy Friday night. Usually when I remember to make the dough ahead of time. Now I can’t say my kids are crazy about whole-wheat flour. I sometimes add less than 2 cups. So, 3 cups white flour and one cup whole-wheat. But this is a fantastic dough to play around with and add whatever toppings you like! If you are missing cheese, go ahead and add some on towards the end of the baking time (like the last 10 minutes). 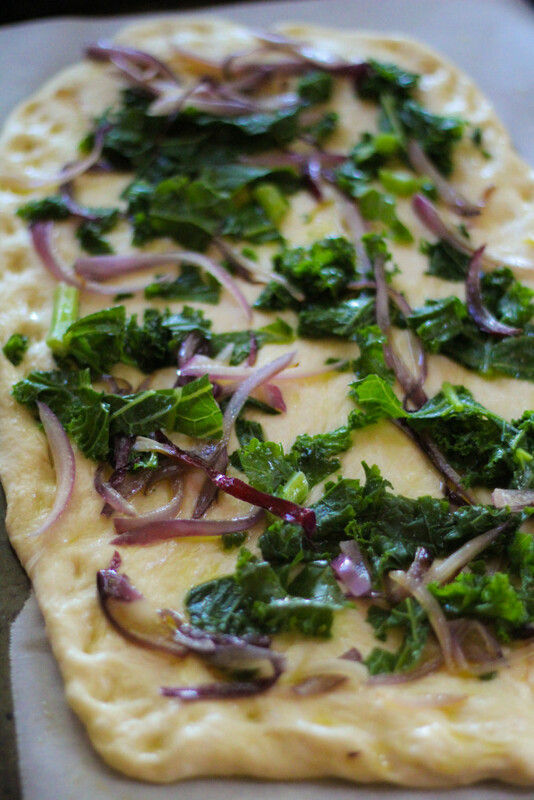 But if you are trying to cut back on dairy, looking to add more greens, want to incorporate a little healthier flour into your diet, this could be the pizza for you! Did I mention that it is vegan!! Eat more pizza! Have fun this week! one 101/2 x 151/2-inch jelly roll an or a 14-inch round pan. Brush another large bowl with olive oil. In the bowl with yeast, whisk sugar, the rest of the olive oil, and salt. Make a well in the middle of the flours and pour in the yeast mixture. Stir with a wooden spoon until a sticky dough forms. Cover with a towel and let it rise at room temperature until doubled in size (about 1-1 1/2 hours). Fill a medium sized pan with water and boil. Add the kale, and cook for about 10 minutes. The kale will still be undercooked. You don’t want the kale to be mushy. Drain the kale; set aside. When your dough has risen, turn it out onto a well-floured surface. It can be a bigger cutting board or your kitchen counter…whatever works for you. With floured hands, knead the dough. If the dough seems a little sticky, don’t be afraid to add a little flour to the board and to your hands…it will get absorbed. Place the dough on a parchment lined pan. Pat and press the dough gently until the dough fills the pan completely. If the dough resists, let it rest for a few minutes before continuing. Cover the dough with a piece of plastic wrap and let it rise again until doubled in size (could take 30-45 minutes). When the dough has doubled in size, remove the plastic wrap. Brush on some olive oil to the surface of the dough. Toss on the kale and red onions. Salt and pepper, to taste. Bake until golden brown and crisp on bottom and sides, 20–30 minutes. Lift the pizza from the pan with the parchment paper edges onto a cutting board.